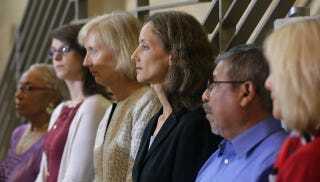 Austin’s assistant city manager has resigned after widespread controversy over a training he organized for city staff on how to deal with their new, mostly female city council. The training warned that ladies talk a lot and are bad at math, and was, strangely, quite controversial. The Austin American Statesman reports that Assistant City Manager Anthony Snipes resigned Tuesday and will leave August 10. He was placed on paid administrative leave after the March 27 presentation, which was led by two Florida-based communication experts, Jonathan Allen and Dr. Miya Burt-Stewart. Allen said he’d learned how to communicate with women by talking to his 11-year-old daughter, while Burt-Stewart quoted from Men are From Mars, Women are From Venus and claimed that women make decisions based on their emotions. Austin City Council members listen during a May 13 news conference by City Manager Mark Ott denouncing the press conference. Ott said he was “ personally am offended and embarrassed by what I saw on video of the training session.” Image via AP.